Lawyer Matthew Shardlake is unwillingly thrown into another adventure involving the court of King Henry VIII in C.J. 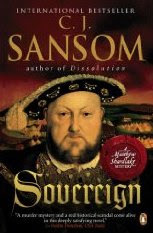 Sansom's third book of the series, Sovereign. In this outing, Shardlake and his trusty companion Jack Barak are in York with "the progress," a visit by the King and his enormous entourage to northern England. The northern part of England had been threatening rebellion for some time, and the king's visit was meant to reinforce his authority over the territory. In addition to the regal show of force, Henry plans to demonstrate his benevolence by agreeing to hear disputes filed by parties in the city. This is where the lawyers come in, as they are the ones who will actually review and decide the cases after the king has "ceremoniously" agreed to look at them. Shardlake and Barak soon discover that there are still many in northern England who would like to see the king overthrown and the country returned to the Catholic faith. One of Shardlake's other duties while in York involves looking after the health of a conspirator who is currently imprisoned and charged with treason. The authorities want to make sure the man reaches London in one piece, where he can be properly tortured into revealing the names of other conspirators. Naturally, several mysterious deaths occur which place Shardlake in danger on several levels. He comes across a dying man who whispers information that seems to indicate that the king is not of royal blood. While attempting to sort out what that information could mean, Shardlake is the victim of numerous attempts on his life. At the same time, powerful men surrounding the king have their own agendas and reasons for wanting to keep information hidden. Unfortunately for him, Shardlake also stumbles onto a secret about the young queen, Catherine Howard, which also has disastrous consequences for him. There are numerous people mentioned that require frequent visits to Wikipedia in order to find out what happened to everyone: the Duke of Norfolk, Thomas Culpepper, Lady Rochford , Thomas Cranmer, Richard Rich, Francis Dereham, etc. I am really enjoying this series, and will be sad to finish the next and so far last book in the series. Hopefully, C.J. Sansom is hard at work on the fifth book! Thanks Sheila! I'm a fan of the gherkin although I think I might be in the minority there!